The Passive Heating & Cooling page discusses other methods use in parallel with solar access design to keep the house warm. We looked at many properties before we found the site where we wanted to build the Zero Energy House. 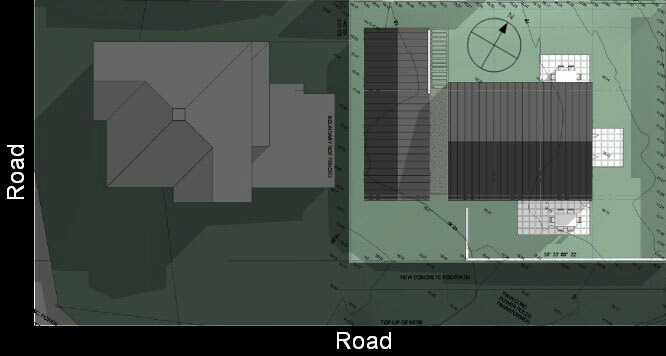 The main criteria with regard to solar access when choosing the site was that it had little-to-no shading from large trees or surrounding buildings. This meant we could make full use of the sun to heat the building in the winter, helping us to achieve one of our main goals of avoiding the need for space heating. 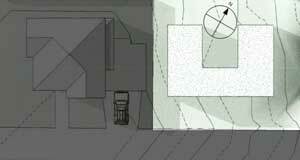 Ensure there would be a north-facing roof space for solar PV modules and hot water collectors. We considered a number of different configurations, three of which are shown below. Maximises solar potential for PV and SHW. Transient or less frequently used spaces where internal temperatures are not so important - such as hallways, bathrooms, laundry etc - located along the south side of the building.